The US is withdrawing military assistance units from Myanmar over the country's treatment of its Rohingya Muslim minority in Rakhine state. The state department said it had also dropped travel waivers for Myanmar military officials, and was considering economic sanctions. Almost a million Rohingya people have fled Myanmar for Bangladesh, says Bangladesh's envoy to the UN. Myanmar's military says it is fighting militants and not targeting civilians. "It is imperative that any individuals or entities responsible for atrocities be held accountable," the US state department said. "We express our gravest concern with recent events in Myanmar's Rakhine state and the violent, traumatic abuses Rohingya and other communities have endured." Last week, US Secretary of State Rex Tillerson said his country held Myanmar's military leadership "accountable" for its crackdown on the Rohingya Muslim minority, adding that the US was "extraordinarily concerned" by the situation. 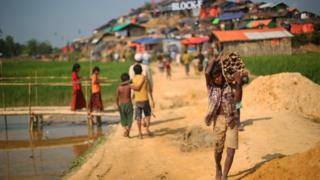 The United Nations has called the violence a "textbook example of ethnic cleansing". More than 600,000 refugees have crossed the border from Myanmar since late August, Bangladesh's UN ambassador said, joining the 300,000 or so which had fled earlier outbreaks of violence. He claimed thousands were still entering his country every day. The Myanmar government considers the Rohingya to be stateless immigrants from Bangladesh, despite their generations-long presence in the country. It claims security forces are battling dangerous militants in Rakhine state after 12 security personnel were killed on 25 August. But refugees say they have seen door-to-door killings, and widespread burning of civilian villages - the latter of which was seen first-hand by BBC reporter Jonathan Head on an official monitored visit which went off-script. Foreign governments, including Washington, have called for a cessation of hostilities and the peaceful repatriation of refugees. But Myanmar's refusal to acknowledge the Rohingya "remains a stumbling block" for any negotiations, Bangladesh's ambassador said on Monday.